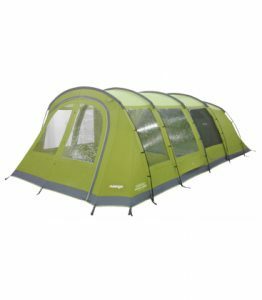 The Vango Kratos 600XL tent is new for 2017 and is available exclusively via the Go Outdoors website and shops. The RRP will be £530 but you will be able to pick up the Kratos 600 XL cheaper when Go Outdoors have special offer weeks and their occasional voucher code promotions. The Vango Kratos 600XL is a really large, poled tent that sleeps up to 6 people – families of four will find it really spacious. Toggled Privacy Curtains – easy to use privacy curtains that can simply be rolled away when not in use.